When doing looking for size optimization it's always a good idea to apply some basic algebra and expand expressions and try to factorize them again in a different way to see if the same result can be expressed in less code (usually at the expense of speed of accuracy). Calculating polygon normals and areas is one of those cases(say, for a mesh). normal(A,B,C,D) = normal(A,B,D) + normal(B,C,D) = AxB + BxD + DxA + BxC + CxD + DxB. 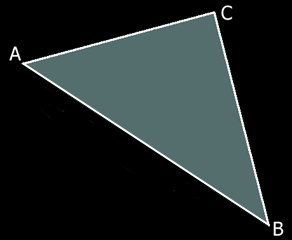 which is again a cyclic alphabetically sorted summatory of one cross product per side of the polygon. Da-daaaaaa! 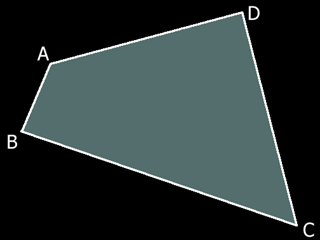 Interestingly, the normal/area of the quad can be also expressed as the cross of the diagonals: (A-C)x(B-D). Indeed, if you apply distribution and anticommutativity to this cross product, you will see it reduces to the same cyclic summatory of cross products. This is extremely useful trick for 4 kilobyte demo coding, when you want to avoid doing some vertex subtractions in order to compute your face normals (and vertex normals too, as explained in the article about clever 3D mesh normalization. The problem this technique might have arises in the cases where the polygons or mesh are big and some of its vertices are far from the origin. In that case the cross products might be dealing with very parallel vectors and the precision of the result might be compromised. THe regular method of computing normals doesn't suffer from this as vertices get subtracted form each other. However, for most use cases, the method presented here works just fine. Promise.